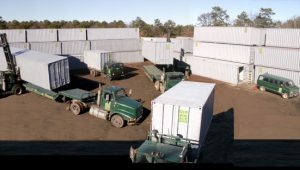 Since 1982 A.B Richards has specialized in the rental and delivery of storage containers throughout New York, New Jersey, Connecticut and Eastern Pennsylvania as well as many other areas in the Northeast. Our high-quality ground level storage containers are easy to deliver to many residential and commercial areas. A.B. Richards provides secure storage container delivery. When scheduling a delivery it is important to provide us with enough information to where the storage container is being delivered so we can have a better idea of what size truck and container to drop off. All projects are different and that is why it is important to request a container rental evaluation with a storage container specialist. What Is The Difference Between A Tilt Bed, Flat-Bed and Chassis Trailer? We use tilt beds when delivering your container with either a straight truck for 20ft containers or a tractor trailer combo for 40ft containers. The truck will back into the spot where you want the container, the trailer will tilt down and a winch will lower one end of the container to the ground. The truck pulls forward as the other end of the container is lowered down. What Do You Need From Me To Drop Off The Container? We need a person on site to sign the paperwork and direct the driver as to your preferred delivery location. Please also have available any blocks or railroad ties that you might want to place under the container. The driver will take care of the rest. Can You Deliver Two 20ft Containers On One Truck? We can sometimes deliver two 20ft containers on one truck, provided the property has enough space to accommodate a tractor trailer. Residentially, we usually deliver one 20ft storage container at a time. For more information on Renting Storage Containers or to schedule a delivery in your area call (800) 597-5971 or fill out our contact form.